Russian state media channels, in a near simultaneous blitz of information, have issued breaking alerts this morning that anti-Assad insurgents in Idlib have begun filming "fake footage of chemical attacks" based on Russian Ministry of Defense (MoD) statements. The Russian Center for Syrian Reconciliation says the "fake footage of chemical attacks" is expected to be delivered to various TV channels and Western journalists before the end of the day Tuesday. "According to the information received from inhabitants of Idlib province, militants are now filming a staged provocation in the city of Jisr al-Shugur, where "chemical weapons" are depicted as being used by the Syrian army against civilians. The film crews of several Middle Eastern TV channels arrived in Jisr al-Shugur in the morning, as well as the regional affiliate of one of the main American television news networks", the Reconciliation Center said. Jisr al-Shugur is a key al-Qaeda held town in Idlib Province, specifically under the control of Hayat Tahrir al-Sham (formerly Nusrah Front, or al-Qaeda). There have been international journalists inside Jisr al-Shugur over the past weeks. "The plot envisages staged scenes showing 'activists' of the Civil Defence ("White Helmets") 'helping' the residents of Jisr al-Shughur after the Syrian army allegedly used the so-called barrel bombs with poisonous substances," the center said. "Several Middle East TV channels and a local branch of a leading US news channel have been sent to the city of Jisr al-Shughur in Syria's Idlib governorate to produce the footage needed for the provocation." This comes the same morning as a new Wall Street Journal report confirms that the White House is now in direct talks with the U.K. and France over plans for a possible third round of coordinated strikes on Syria should the Syrian Army use chemical weapons during its Idlib assault. Speaking to reporters after a major speech on Monday, US national security advisor John Bolton slammed Moscow's allegations of an impending staged "chemical provocation," saying "That has to be, in the history of propaganda in the 20th and 21st centuries, one of the most outrageous claims that I can think of," according to the WSJ. 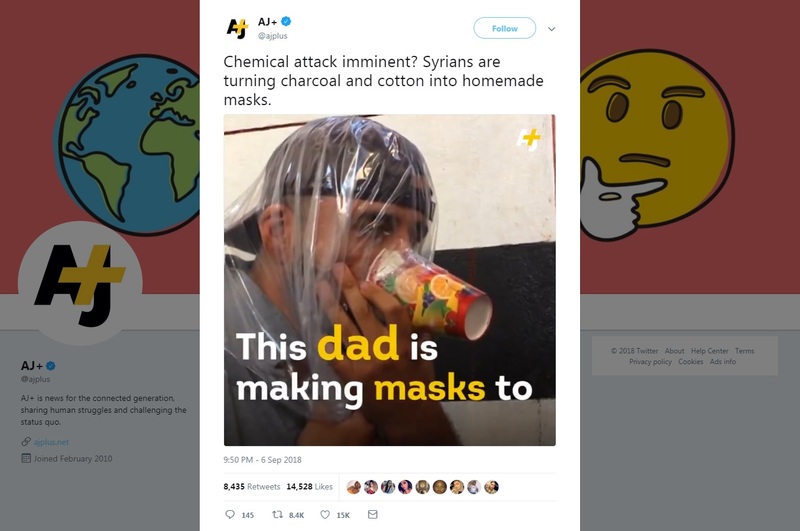 Meanwhile in Idlib, some truly strange theatrics have already begun, with Al Jazeera depicting locals preparing paper cups, bags and cotton, which are somehow supposed to serve as "chemical protective" gear. Reuters has also promoted some of the images of residents with plastic bags over their heads in recent coverage. The Al Jazeera (AJ+) report aired late last week, and ranks as one of the more bizarre propaganda stunts we've seen from the Qatar-based channel. For starters, nerve agents are absorbed through the skin, and quite obviously a little cotton and charcoal can do nothing to protect from a real gas attack. The Al Jazeera filmed stunt seems to point to � at least on an anecdotal level � early conscious attempts by the armed groups controlling Idlib to stage exaggerated theatrics, and further points to international media's willingness to promote such stunts with no critical review whatsoever.